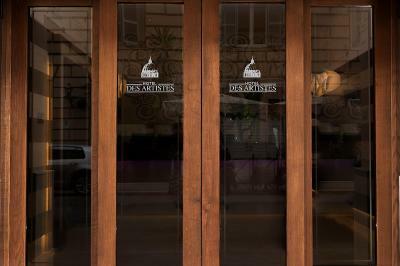 Lock in a great price for Hotel Des Artistes – rated 8.4 by recent guests! I have booked a superior single room and when I arrived they gave me a free upgrade to the double bed room which was really nice and kind of them. 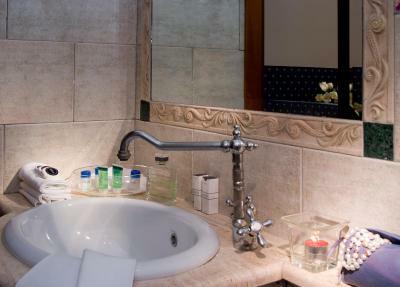 I liked the location, friendly staff, style of the room and bathroom/toilet were great. Excellent value for the money really. I would highly recommend it to anyone. large room. wide tv. clean and tidy room. position. staff very kind. The staff was really helpful, the rooms were clean and comfortable! We decided to walk form the hotel to the main attractions, although a Metro station is just two blocks away. The front deck staff was terriffic. Extremely helpful and friendly The room was clean and met my needs. I was looking for good, not elegant. The price as very reasonable. The location was close to the train station, but not in the thick of the tourist traffic. The restaurants and cafes seemed to be more for locals which is exactly what I wanted. Awesome and safe location, great breakfast, extremely clean. Probably the best service and the nicest staff we have seen. I was specifically amazed by the cleaning service. We left for breakfasts for about 20 minutes and some magic happened - everything was perfectly clean! I would like to thank everyone, working in Des Artistes hotel. 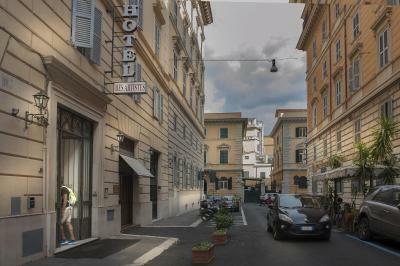 Definitely made our stay in Rome amazing, thank you, Des Artistes! The room was very comfortable and clean. The staff were very helpful. Good variety of food for breakfast. Staff was incredibly helpful and knowledgeable. I needed help on several issues and they solved them immediately. Hotel Des Artistes This rating is a reflection of how the property compares to the industry standard when it comes to price, facilities and services available. It's based on a self-evaluation by the property. Use this rating to help choose your stay! 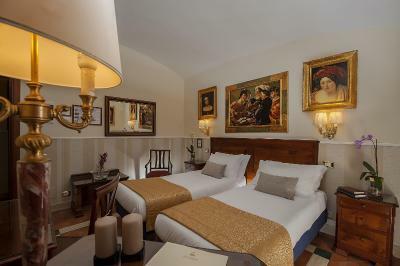 Offering air-conditioned rooms, a rooftop terrace and free WiFi throughout, Des Artistes is a family-run hotel 650 feet from Castro Pretorio Metro Station. 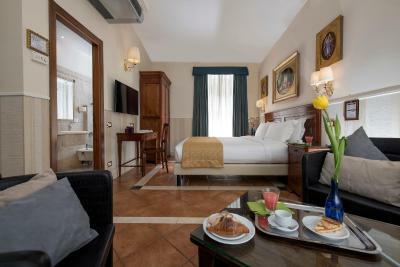 Termini Train Station is 10 minutes' walk away. 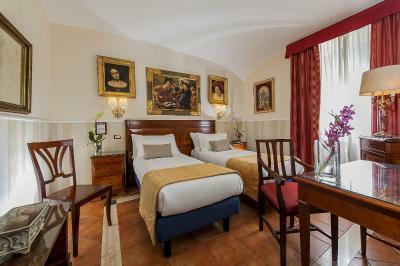 Rooms have a classic design with antique furniture and works of art. They all feature satellite TV, a fridge and a private bathroom with toiletries. Breakfast at Des Artistes is a sweet and savory self-service buffet including scrambled eggs, cold cuts and cheese. Breakfast can be enjoyed on the terrace in warm weather. 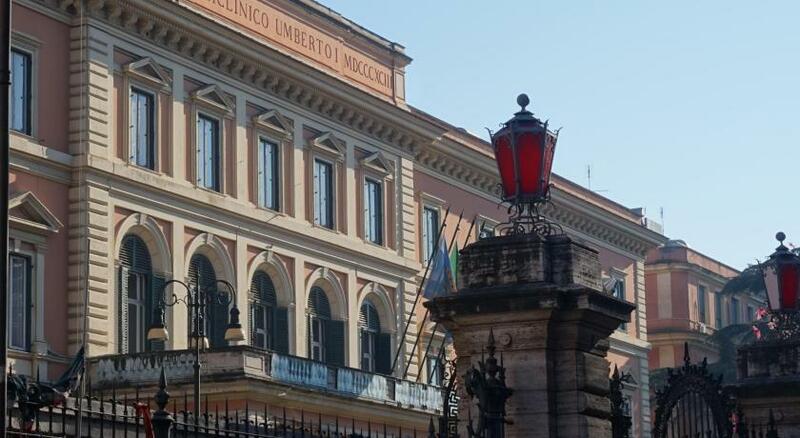 The hotel is just over the road from the National Library and a 5-minute walk from Policlinico Umberto Primo Hospital and La Sapienza University. You also have excellent bus links across Rome. 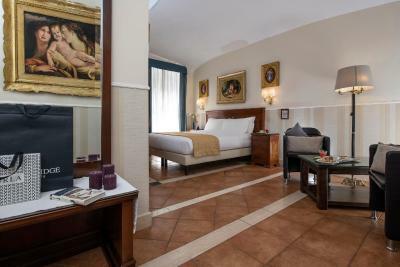 When would you like to stay at Hotel Des Artistes? 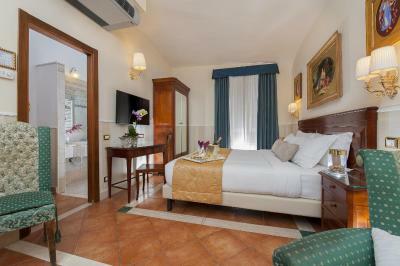 Classically decorated room with satellite TV, a fridge and air conditioning. WiFi is free. It is located next door to the Des Artistes. Check-in and breakfast take place in the main building. This room may be located in the main building or in the annex. 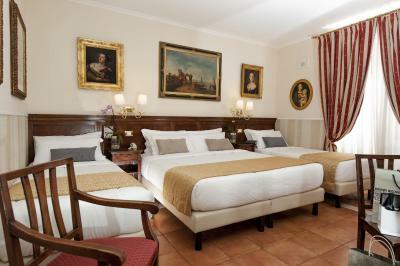 Classically decorated room with satellite TV, a fridge and air conditioning. Comes with a small double bed and free WiFi. 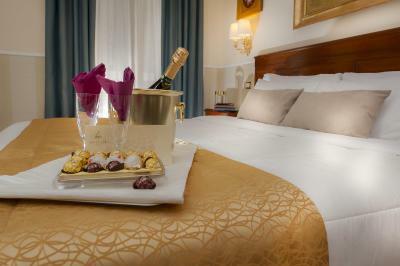 House Rules Hotel Des Artistes takes special requests – add in the next step! Hotel Des Artistes accepts these cards and reserves the right to temporarily hold an amount prior to arrival. When booking a stay of 8 nights or more, different payment/cancelation policies will apply. Stuff is very kind, breakfast has so many foods, bed is so comfortable!! The layout of the hotel is a bit strange but it wouldn’t stop me going back. The breakfast was a bit limited as well, I wouldn’t have paid the extra there to have it, however our breakfast came in the price of the room so we did take advantage of that. 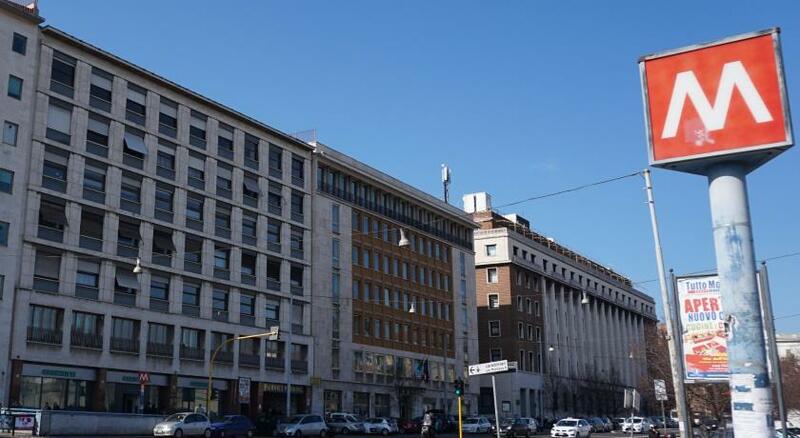 The property was nice and close to the main train station in Rome which was handy for arrivals and departures to the airport. It was quite a long walk to sites, which we didn’t mind. However the metro was really easy to use and not far at all from the hotel. We got the metro over to Vatican City which cost €3 for two of us and then walked back to the hotel gradually while seeing other sites along the way. The room was nice and clean, plenty of space for the two of us. The bathroom was nice and clean as well, with a good shower. There was one hand and one body towel each though so if you like to have extra towels you’d need to ask straight away for those. There was a extra €12 fee from the hotel when we arrived which I wasn’t expecting or had been warned about. Not the end of the world but would have been nice to have known this was coming so I could have taken it in to consideration before hand! 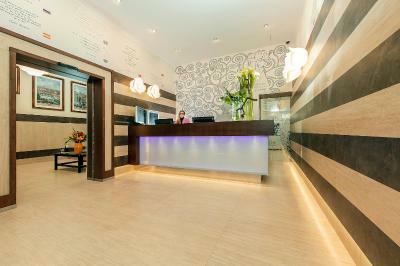 The staff was super friendly (especially Juliet from the reception! 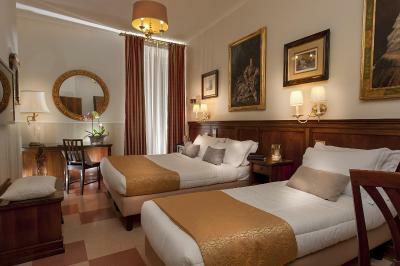 ), rooms were clean and beds were very comfy! Breakfast was okay. Not much selection. Omelet was dry and tasteless.. there were pastries but I didnt try any of it as it looks old. The breakfast was great, the room was very clean. Everything was perfect. There was no electronic tea kettle (water boiler in the room) so I could not prepare tea for myself in the room. That is the only negative for me and perhaps soundproofing of the rooms was weak as you could hear people watching TV, talking, etc however soundproofing was great when it comes to the noise from the street. 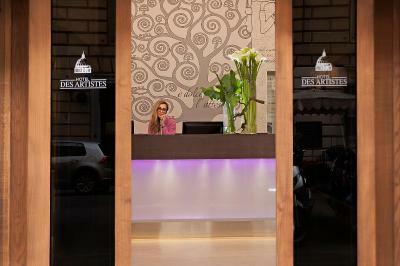 Very warm, cosy place, nice decoration, excellent breakfast and very polite and professional staff. Definitely will visit again next time. Bed really comfy, good location, decent breakfast.